Wife of the Lagos State Governor, Mrs. Bolanle Ambode; Governor Akinwunmi Ambode; 2nd Prize winner, female category, Alemnesh Herepa (Ethiopian); winner of the female category, 2019 Lagos City Marathon, Dinke Meseret (Ethiopian); 3rd Prize winner, Kebena Chala (Ethiopian); Group Managing Director, Access Bank, Mr. Herbert Wigwe; Minister of Youth and Sports, Barr. Solomon Dalung and Managing Director, Diamond Bank, Mr. Uzoma Dozie during the presentation of prizes to winners at the 2019 Lagos City Marathon at the Eko Atlantic City, on Saturday, February 2, 2019. 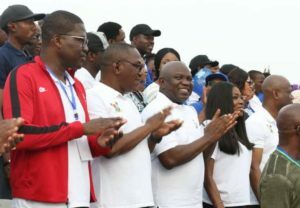 Lagos State Governor, Mr. Akinwunmi Ambode (middle); his wife, Bolanle (2nd right); Group Managing Director, Access Bank, Mr. Herbert Wigwe (right); Minister of Youth and Sports, Barr. Solomon Dalung (2nd left) and Head of Service, Mr. Hakeem Muri-Okunola (left) during the 2019 Lagos City Marathon at the Eko Atlantic City, on Saturday, February 2, 2019.